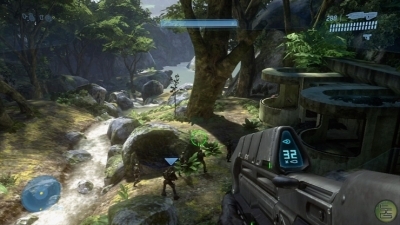 Halo 3 is one of those titles that I just never picked up. Even though I only recently (i.e., within the past year) bought a 360, the latest game in the Halo series wasn’t one that I just had to get hold of right away. I actually avoided it for as long as possible for a variety of reasons, but a certain someone, along with the price tag that comes with a game that’s close to two years old, convinced me that it was probably time to finally see what folks have been talking about. Buckle up tight, folks: this week in co-op, we take a day trip to New Mombasa. Thanks to the wonders of Wikipedia, I’ve been able to keep up with the plot of the Halo series despite not having played the second one and it having been 6 years since I played the first. So I had no problem jumping into the boots of the Arbiter and knowing roughly what’s going on in the world of Master Chief. Even if I didn’t, playing a character voiced by Keith David would be enough to keep me happy, which is a good thing as my trip back to the world of Halo wasn’t exactly a smooth one. Mike: Dammit! Where the hell did that brute shot come from? Me: oh… there was totally this brute over there that I couldn’t kill in time because he had Precursor shields. Mike: There are no Precursors in this game, Jason. By the time we reached the UNSC outpost, I was finally getting into the swing of things and, much to Mike’s relief, had reduced the number of “co-op buddy with a rocket launcher” related deaths. Before the cut scene that introduced the next level was over, Mike was already giggling. I was confused but he told me to just keep watching. And then it happened: “Where are we going?” “…to war…” That little exchange became the new call and response for the rest of our evening, with several variants depending on which voice actor was talking at the time. … before my driver drove off a cliff.